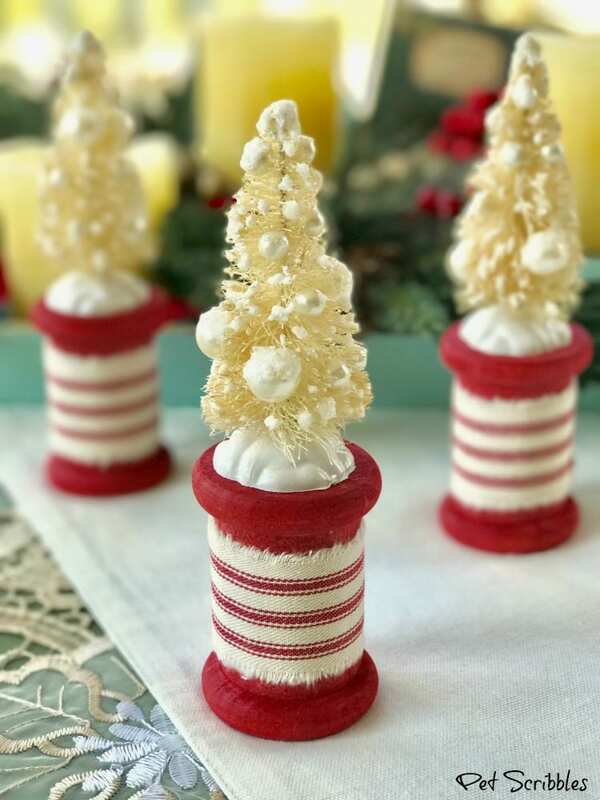 Come and see how I put together these ivory bottle brush trees on red spools for a farmhouse style look. 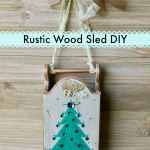 A little bit rustic and a little bit Winter glam! 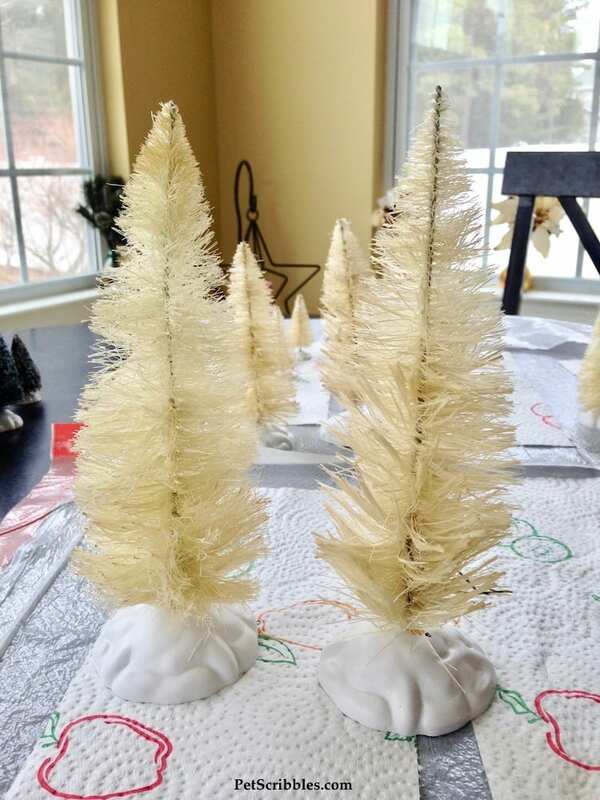 Years ago — I bleached these bottle brush trees. 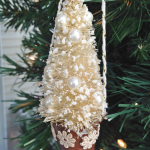 At the time, you couldn’t readily find bottle brush trees in ivory or any other color than green. 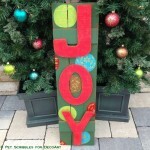 Of course now you can find just about any color you can think of in the craft stores or on Etsy. 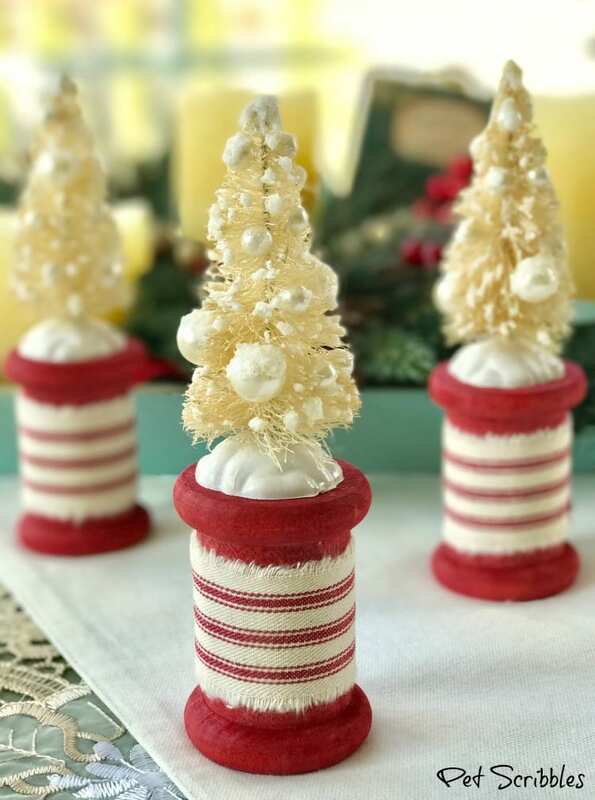 Every time I see ivory bottle brush trees in online or in stores, I just laugh at how easy everything has become. 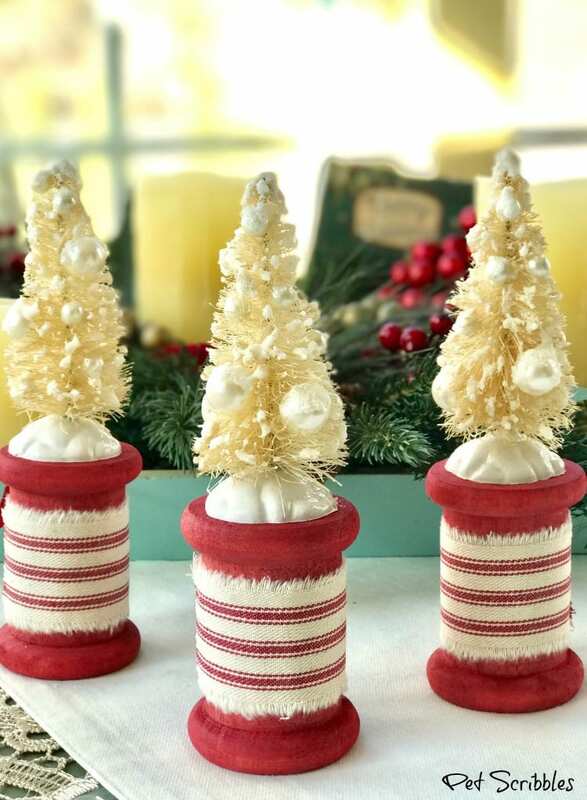 You want ivory bottle brush trees? Don’t bleach them, just buy them! First I dyed the unfinished wood spools with Tattered Angels Glimmer Mist in Cross My Heart red. I was excited that the wood matched the ticking fringe perfectly! 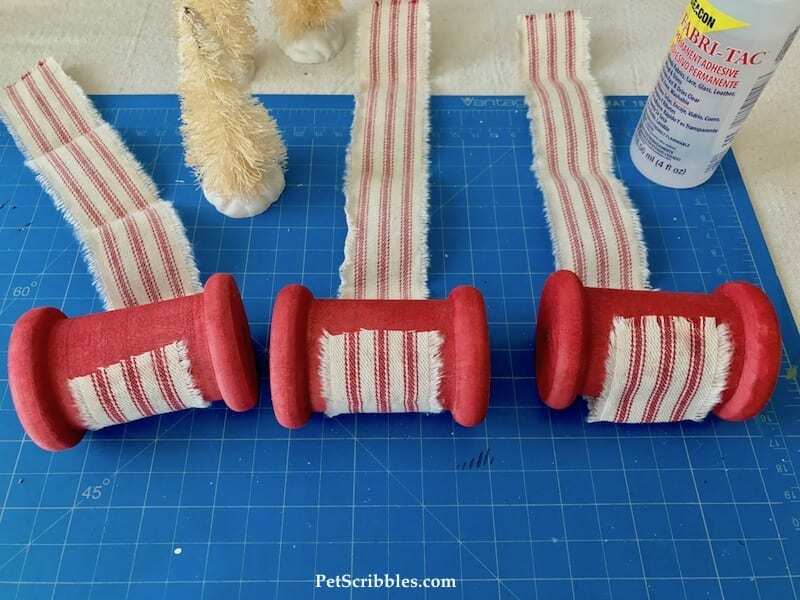 I measured off a length of the ticking to wrap around each spool. 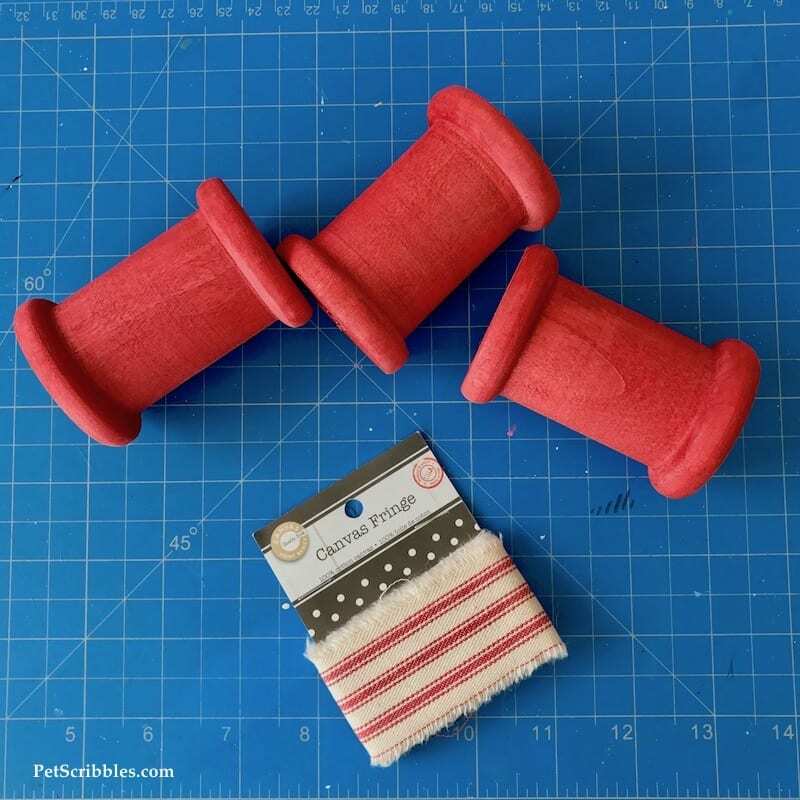 Using Fabri-Tac adhesive, I attached one end of the ticking to each spool, as shown below. 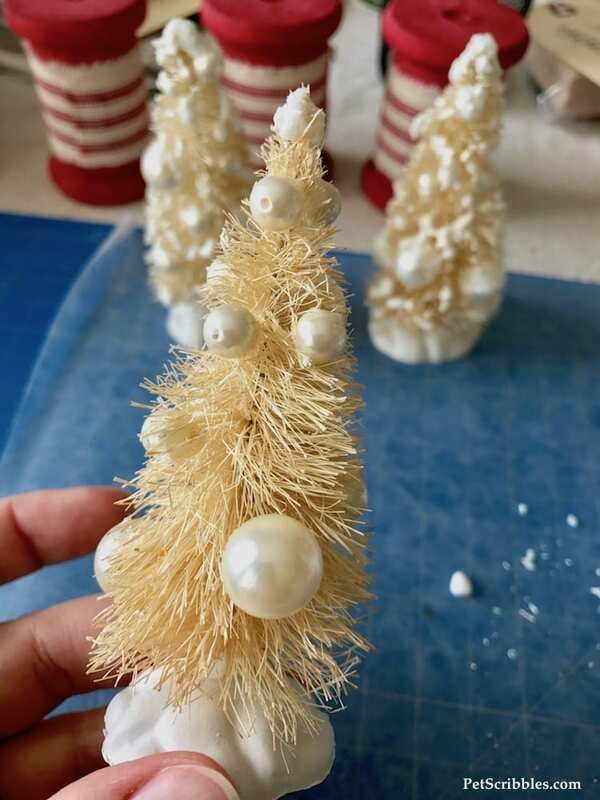 While I let the adhesive on the spools dry thoroughly, I began adding pearls of different sizes to each bottle brush tree. 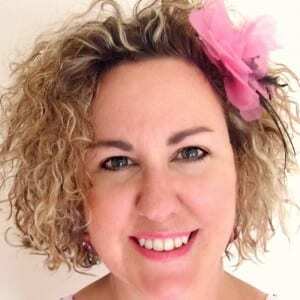 I used the Fabri-Tac adhesive to adhere the pearls – it worked great. 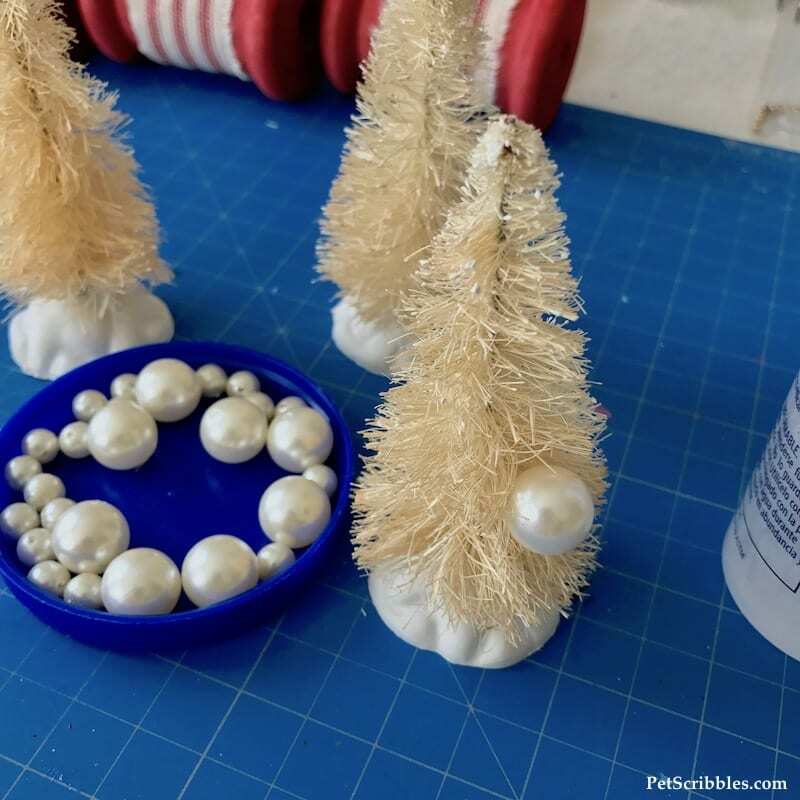 After adding the largest size pearls, I added medium sized pearls here and there. 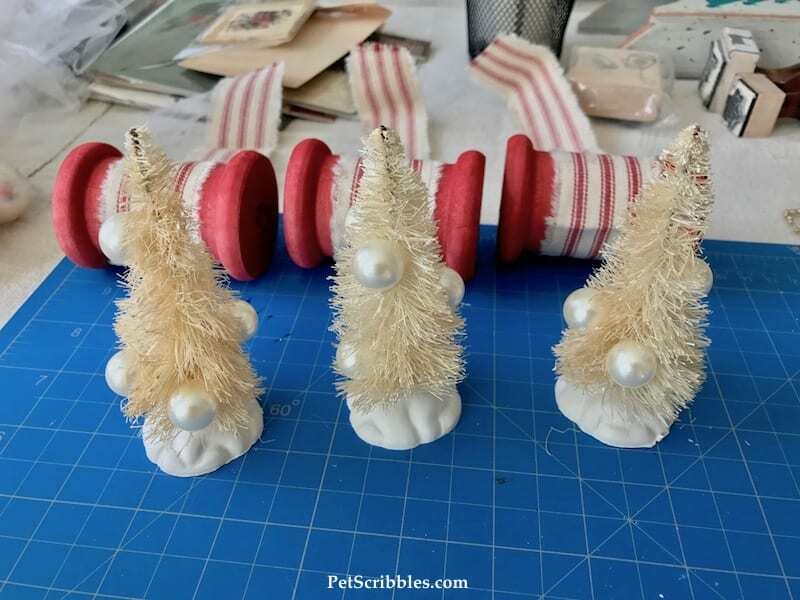 Let the trees sit for at least several hours so that the glue can dry and cure. 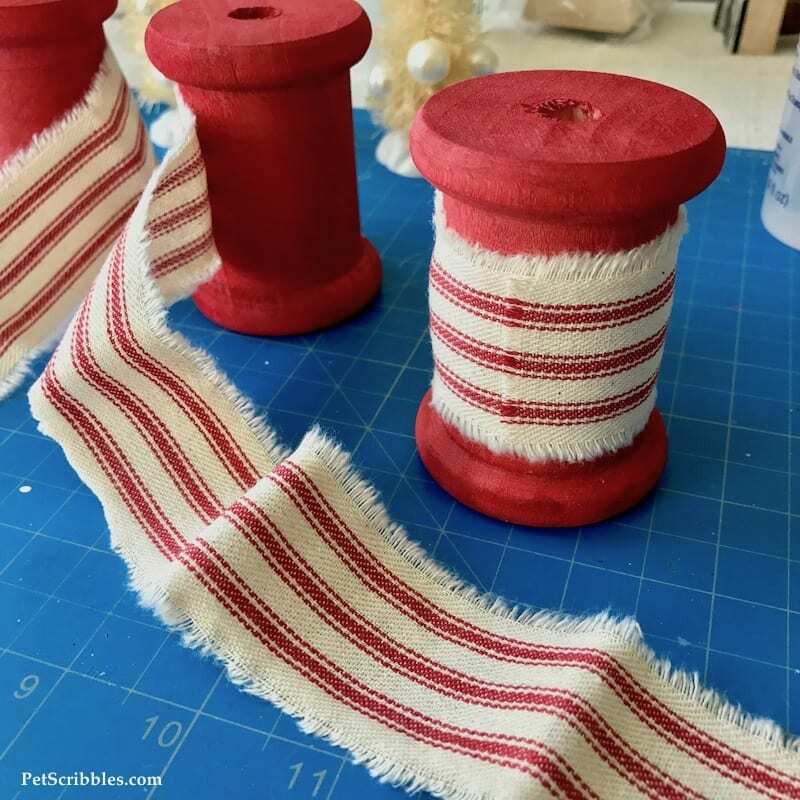 Take each spool and wrap the canvas ticking fringe around the spools tightly, then seal the remaining end with Fabri-Tac. 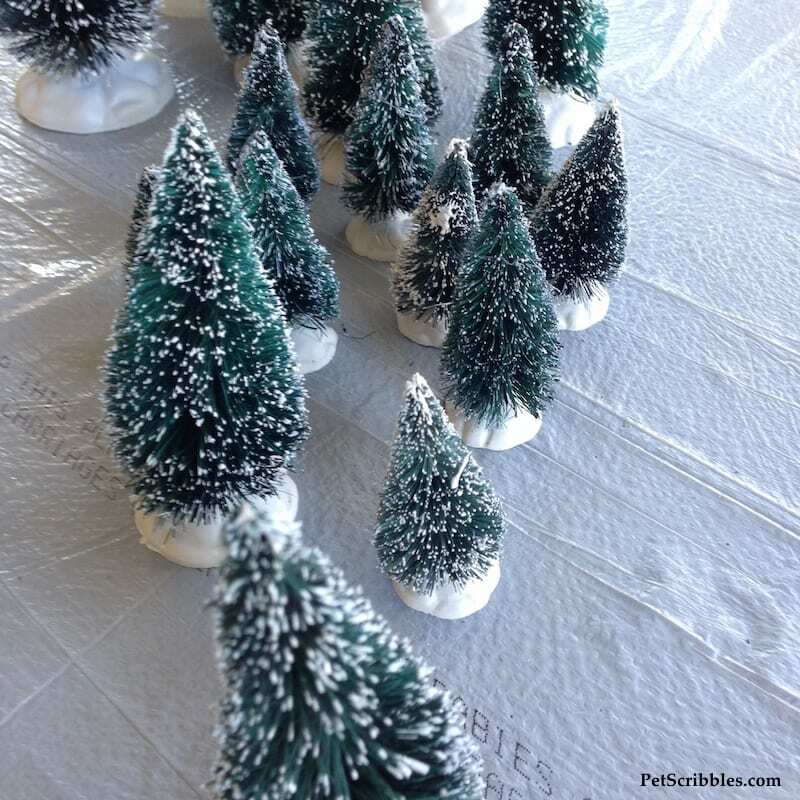 The trees still looked a bit sparse, so I added some glistening snow to fill them out. I began at the very top of each tree, with snow completely covering the top, as shown above. Helpful tip: In the image above, you can see some of the bead “holes” are visible. 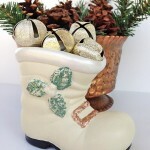 These can easily be covered up with fake snow, which is what I did! 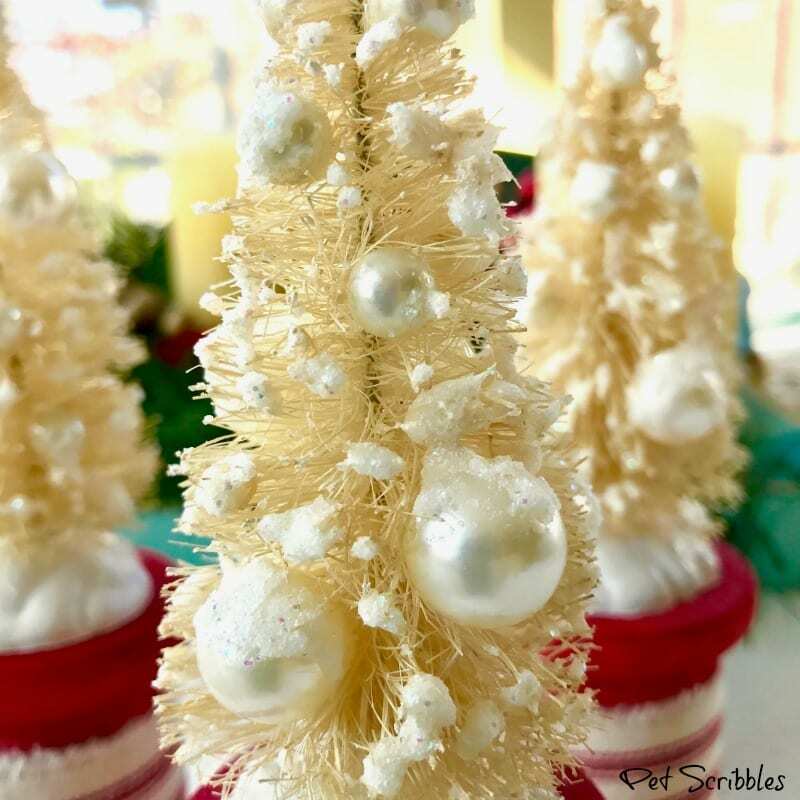 See my detailed instructions for how to apply Glistening Snow-Tex Glittering Snow in my blog post How to make a beautiful bottle brush tree ornament. 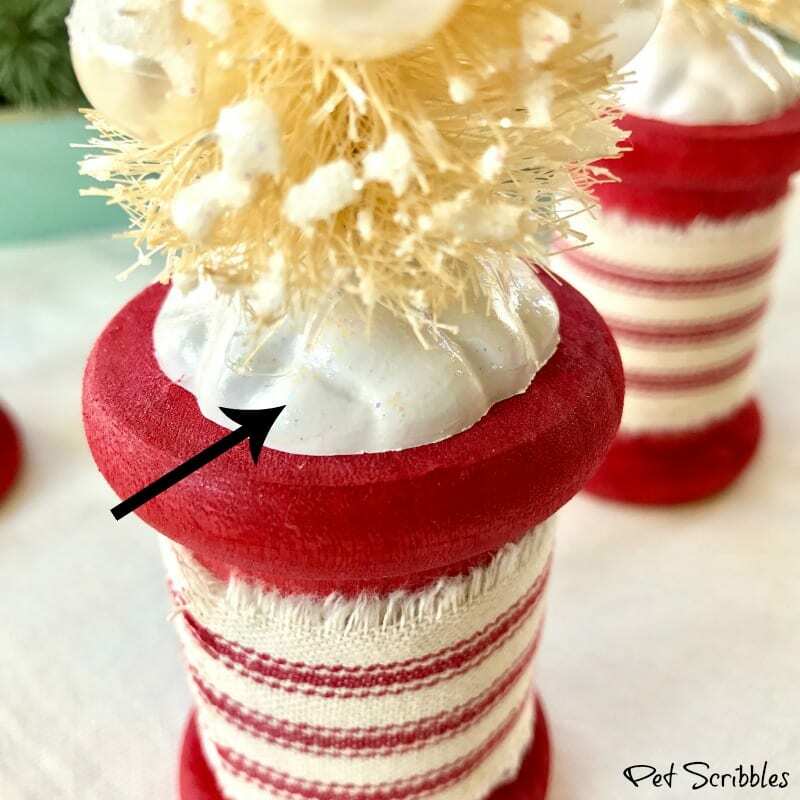 In the close-up image above, you can see that I made sure the snow “fell” onto the tree branches and the ornaments. I love how it looks! 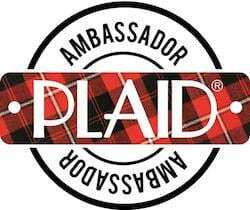 The package directions say it takes 24 hours for complete drying time, so plan for this before proceeding to the next step. 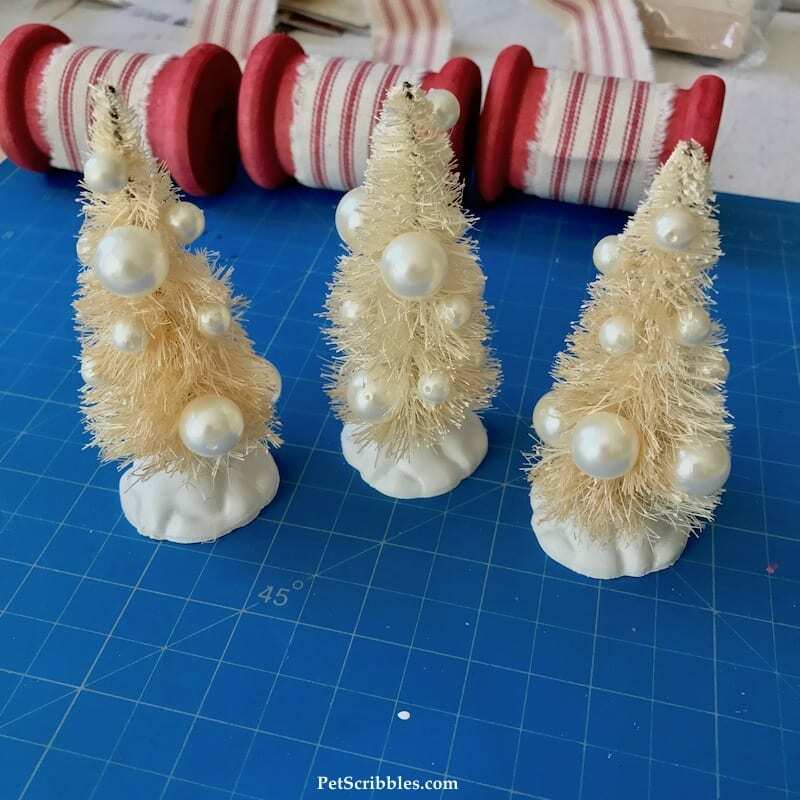 I attached the trees to the spools using E6000 Adhesive. 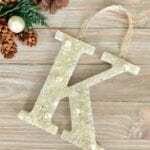 Let the adhesive dry and cure thoroughly. 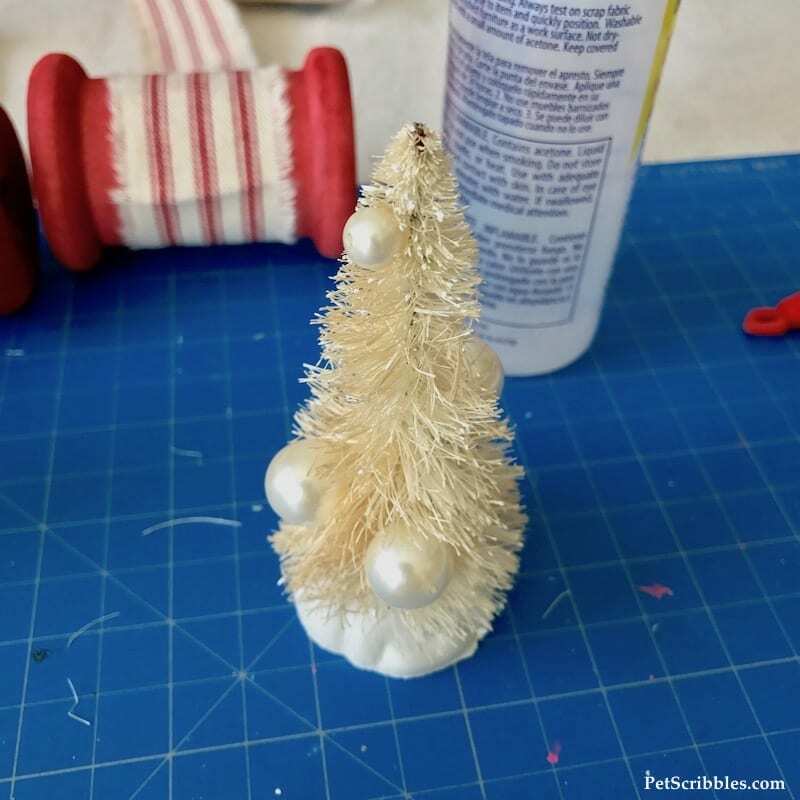 I painted a coat of Sparkle Mod Podge onto the white base of each bottle brush tree — see below — which matched the sparkle in the trees from the glitter snow. 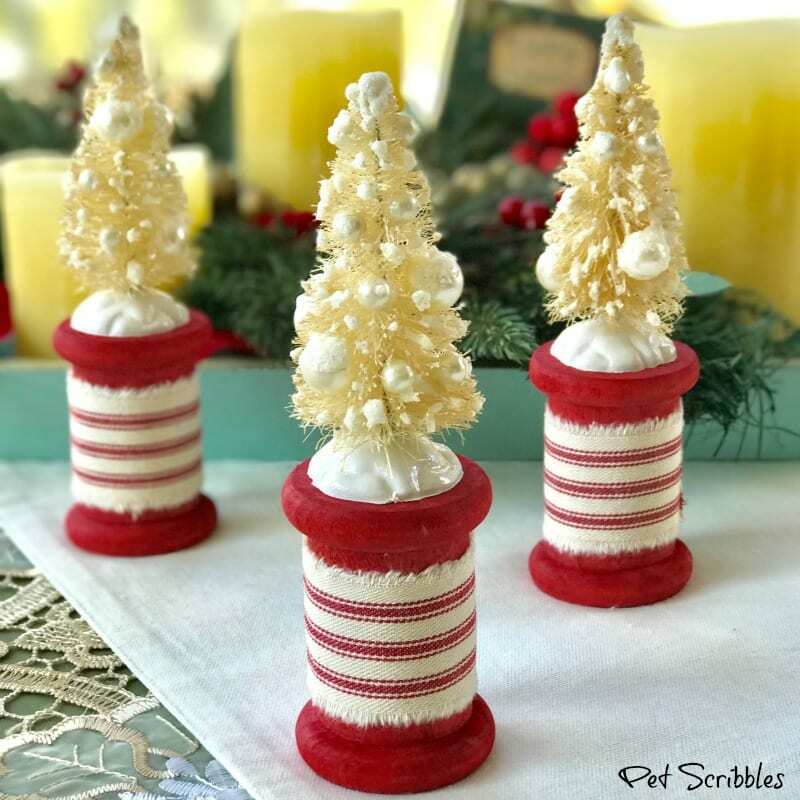 Once everything dried and cured, I had a sweet trio of decorated ivory bottle brush trees on rustic red spools! 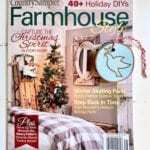 I love the mix of raw stained wood, farmhouse ticking fabric and bottle brush trees filled with pearls and glittery snow! 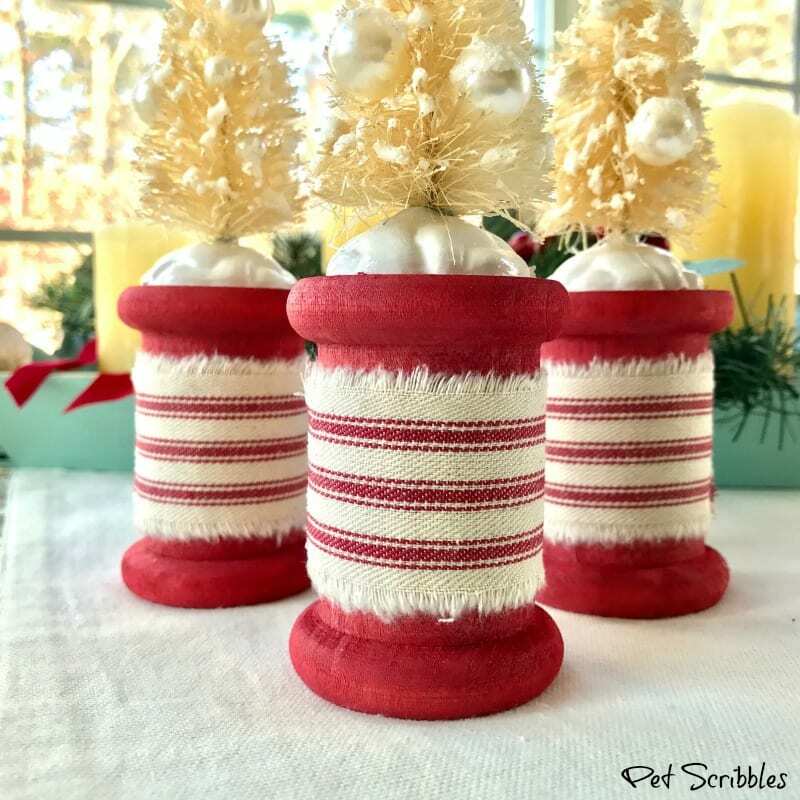 Decorating bottle brush trees is so much fun!